Brooklyn NSW is named after its New York counterpart whose bridge was designed by the same company. Brooklyn Baths up on the Hawkesbury River have really useful depth markers against the shark fence on the riverside of the pool and along one of the sides in the shallower waters. These are essential for swimmers as the tides can vary the water depth enormously, and with the water being a bit murky – at least on the December morning I pitched up – there’d be no other way of knowing how deep you’re getting, or more importantly, whether you have enough depth to swim at all. High tide is best at Brooklyn Baths, when the little sandy beach is completely covered and the water along the fence furthest into the river can reach over 2m. 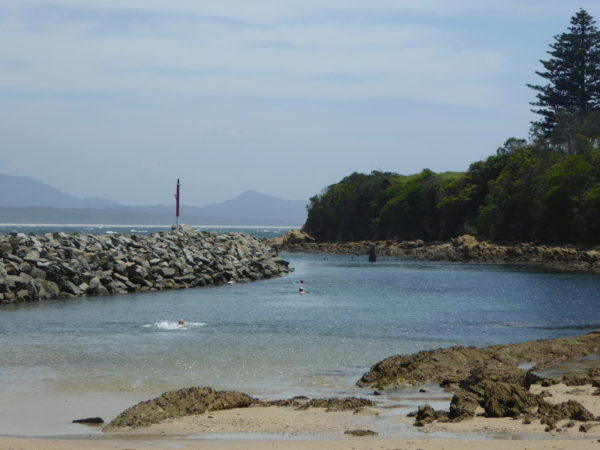 By low tide, you may only have 1m of water to swim in, even at this deepest point. Not very comforting words for someone who enjoys doing backstroke, and who is pretty blind without my glasses, so I have to be almost on top of something before I see it usually. Still, on this warm December morning there was no sign of any other wild life in Brooklyn Baths; and the waters were actually even too muddy to see any fish that might have been swimming alongside me. I’m not making it sound very pleasant, I realise. But actually, I loved it at Brooklyn Baths. It’s a really peaceful spot on the Hawkesbury, with lots of history and a lively community on and around the old Princes Highway. There’s lots of human activity to watch as you swim: trains heading past on their way to or from Newcastle and Brisbane, ferries taking tourists and locals to the little islands dotted around the river, and of course flocks of fishing boats, all looking pretty active in the area. There were kookaburras laughing nearby, cockatoos screeching and diving past me in the pool. And when the sun came out, this became a lovely spot for a dip on a humid day. You can actually do proper laps at Brooklyn Baths, if you can swim in a straight line. The pool enclosure must be a good 50m long. You just have no lane markers and that murky water makes it hard to stay straight. Easiest way to get to Brooklyn is by train. The station at Hawkesbury River is just a five minute walk to the baths. Trains to Newcastle and Sydney run hourly. Biggest problem if driving here is parking. Fine on a weekday morning outside the holidays, but at weekends, it’s much harder to find a spot in Brooklyn. There are vertical metal steps to get into the deeper part of Brooklyn Baths, further into the river. But otherwise just paddle in via the small sandy beach. 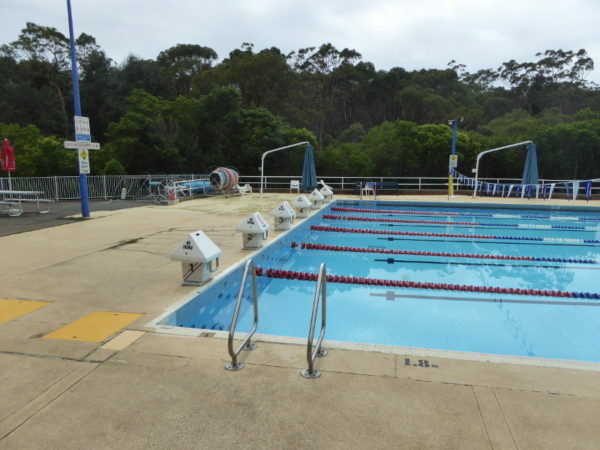 Come as near to high tide as possible, but check the water depth via those markers along the pool shark fence. At low tide, it does become pretty shallow and muddier. (The first bridge over the Hawkesbury River was built in the 1860s by the same company that built THE Brooklyn Bridge near New York – actually, they struggled a bit in the terrain here and the first bridge began to sink not too long after, so the current bridges take a different route over the river). Swimming blogger Sally came to Brooklyn and wrote about it as long ago as 2007. 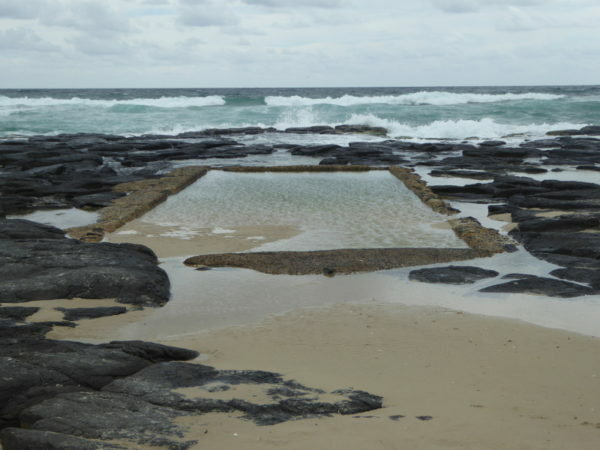 The Lazy Swimmer’s tour of rock pools and harbour baths ended in Brooklyn in 2011. The North Shore Mums bloggers have even made it as far north as Brooklyn. And last link on Brooklyn Baths is from a website I hadn’t come across before. This is Kalatas’ take on Brooklyn in 2014. You can get a decent coffee with fantastic views over the river at the King Island Café just 100m from the baths at Brooklyn. I personally preferred the coffee (and excellent cake) at the Brooklyn Deli a bit further up the road into the village. But I will come back on Thursday, Friday, Saturday or Sunday, when the real coffee specialists on Brooklyn are open. On this occasion I could only gaze through the window longingly at the Marzocco machine and the menu of speciality coffee from Small Batch roasters in Melbourne. This is surely the place for coffee in Brooklyn, NSW, but you have to get your day right for the post swim coffee here. I was also left frustrated by the rare sight of a tea room in Brooklyn NSW. The Tea House even has the wonderful Tippity Teas on the shelves. But this, too, was closed, and the owners, who were there working on another business venture in pure Local Hero (film set in small town Scotland) style, said they just hadn’t got time to run the tea room at the moment, and there wasn’t enough passing trade during quiet weeks in Brooklyn. Another place to watch for, though, if you go on the right day to Brooklyn, NSW! What a fantastic review site. I lived in Hornsby for 17 years, and I didn’t even know Brooklyn had a pool. Glad you like it, Mary, and thanks for contributing to it. Always nice to discover new things you didn’t know were on your doorstep isn’t it? I was so excited to go today but I jumped in on the wall side and caught my foot on some thing sharp and cut it open pretty bad. Please everyone don’t be as silly as I am because it’s actually super fun. A big shout out to the cafe guys near the bottle shop who helped me clean it up and offered a mean time bandaids and stuff so I could get home without bleeding everywhere.